Time's Up! Title Recall! - We had a board game night which consisted of about 15 casual fans aged from about 12 to 60. We split into two groups - one group spent the night playing Codenames and Boom-o while our group only managed to play to play one game. We were going to start with Times Up, but everyone was enjoying it so we even decided to do the optional round where you need to hold a pose for your team to guess. If you haven't played Times Up yet, its by no means a strategy game of any sort. It is a party game similar to many other 'guessing' type games and sure feels like something you've played before when you first start. However as the rounds progress you continue to give clues for the same 40 cards each round until the game ends. How exactly is that fun? Well each round the restrictions become tighter to the point you can't speak and have to do actions, or in the case of the optional fourth round can only strike a still pose while your team has their eyes closed. It's amazing the lingo you'll create and how some simple clue can turn into the longest answer, and for anyone who stops for a look late in the game they'd be completely lost to the point they'd think everyone else was cheating. It's deceptively a brilliant party game and one highly recommended for a light night with friends. 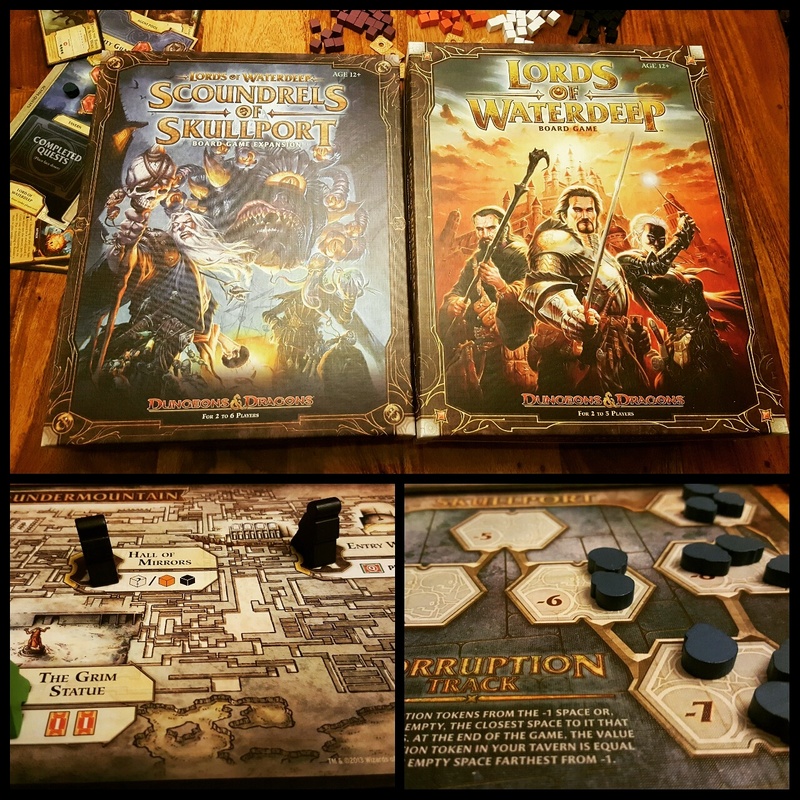 Scoundrels of Skullport - I can't remember exactly when I purchased this expansion to Lords of Waterdeep, but as much as I've often heard how much better it makes LoW for the most part it's been sat on the shelf untouched. It just seemed pointless to add as I was still enjoying LoW and didn't really feel the need to complicate it and add in a bunch of new rules etc. Well I was wrong. It happens from time to time and I've no problem with admitting that we should have added Scoundrels of Skullport a while back. Its the exact same game, but improved upon in basically every way! This isn't an expansion that completely changes the base game, it merely gives what's already there so much more life. Decisions are far more weighted, Intrigue cards were played every round multiple times and the corruption! How good is the corruption mechanic! Its just ever so tempting to think okay I can afford to take one as I'll be able to lose it later, only to find a couple rounds later you have 5 of those pesky blue skulls sitting at your tavern! If you like LoW then I'd highly suggest getting the expansion as it just makes for an overall better game, with new cards, new lords, new quests, new action locations and new rules that can literally be learnt in two minutes. The game doesn't become complicated but your strategy certainly does as you can accomplish so much more. We really enjoyed this expansion and will most likely include it for all future plays. 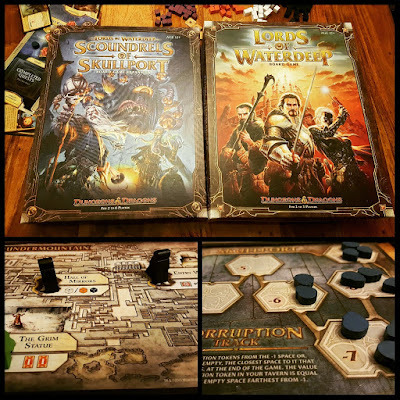 There is two expansions in the box, but they are minor enough that you can include both on your first play and I'd be very surprised if anyone thought Waterdeep was better without the Scoundrels!